Rule #2: Use cold milk if your roux (i.e. melted butter with flour) is hot or hot milk if your roux is cold (they both have to be at different temperatures to avoid lumps). Our easy recipe for bechamel sauce is also the basis for the delicious Mornay sauce or other white sauces used to coat vegetables. We even use this easy recipe for bechamel sauce recipe when making homemade macaroni and cheese. 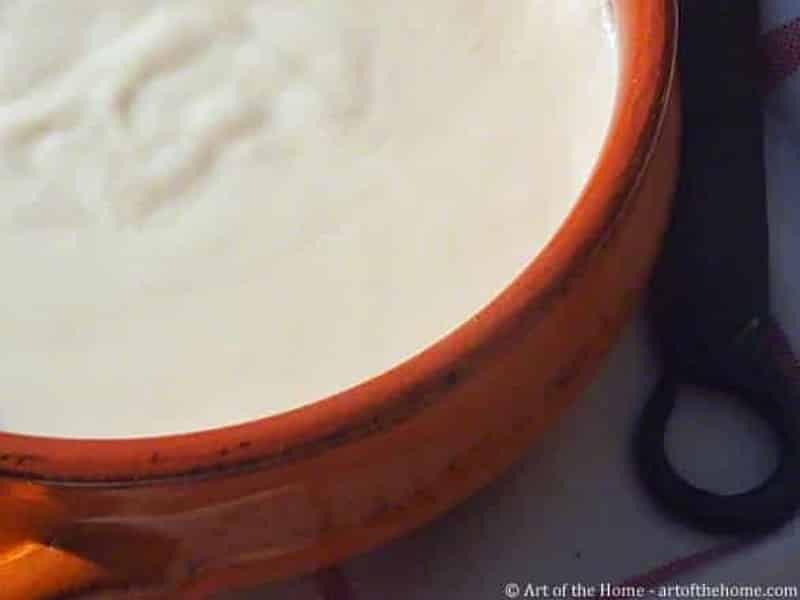 So check Art of the Home easy recipe for bechamel sauce below as well as Art of the Home suggestion. Enjoy and bon appetit! Melt 2 TBSP butter in a saucepan. The butter should not change color. Now let’s add cold milk, all at once. Cook over low-medium heat, whisking without interruption until the desired thickness — 5 to 10 minutes. After about 5 minutes, your bechamel sauce will become to thicken. For a thicker sauce, cook your bechamel sauce for the full 10 minutes. Your bechamel sauce is ready! Top your croque-monsieur with bechamel sauce and gruyère before toasting — so rich and creamy!